Many quilters who work completely by machine have an applique phobia--they call applique the "A" word. But here's the catch: you might not do the technique (yet) but you admire it. Warning: if you're attracted to applique, one day you'll get sucked into doing it. Trust me. I wasn't ever going to do curved patchwork and ended up writing a book on it! 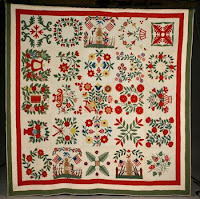 So, a few pictures of favorite applique quilts are in order, starting with a British, late 19th-century medallion quilt. This quilt is in the collection of the Beamish Museum, a unique museum in northern England where you can view whole workshops and homes that look as if the occupants had just gotten up and left that morning. Put Beamish on your list of places to visit when you go to England. Here's their website http://www.beamish.org.uk/ . One of my favorite applique quilt styles is the Four Block set. As in, four honking BIG blocks. 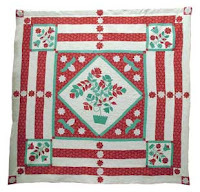 This c.1880 quilt has zinnia-like flowers plus blooms that look rather like coxcombs. 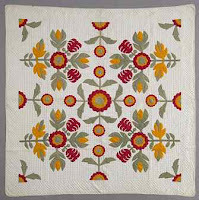 and then is complemented by single flowers at the North-South-East-West points of the square quilt. Nothing shy about this composition! 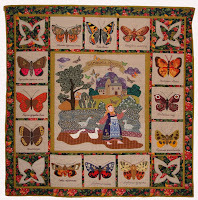 The quilt's owner, Judy Roche, shared that this piece is from central Pennsylvania and has close cross-hatch quilting all over it. She says, "Great folk art!" and I concur. Or this contemporary applique quilt made in Russia. Isn't it wonderful that people are quilting all over the world?